The phrase ‘Free Motion Quilting’ makes my shoulders become tense and my heart rate increase! I am much more at home with a thimble on my finger hand quilting in my favourite chair. But this year, SewCalGal has offered an opportunity for all of us to challenge ourselves to become better quilters with our sewing machines. 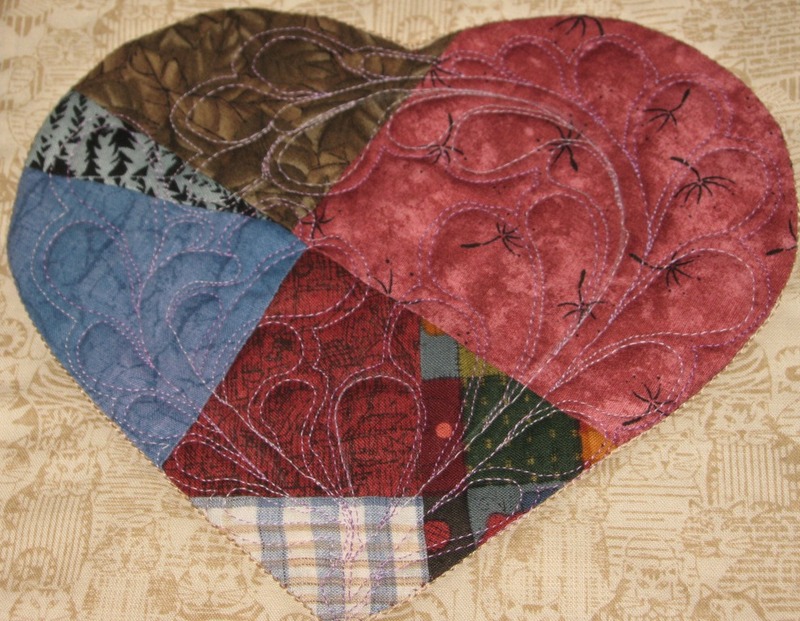 When Jenny and I were discussing ideas for Hearts, Hearts and More Hearts, I shared my scrappy heart quilt top and decided it was an ideal top to use for honing my machine quilting skills. There are 12 blocks and 12 months of tutorials..what could be easier? The January tutorial is presented by Frances Moore . I have used Aurifil 50wt for the FMQ in the top and in the bobbin. Frances Moore’s video gave me confidence to complete the first heart block. 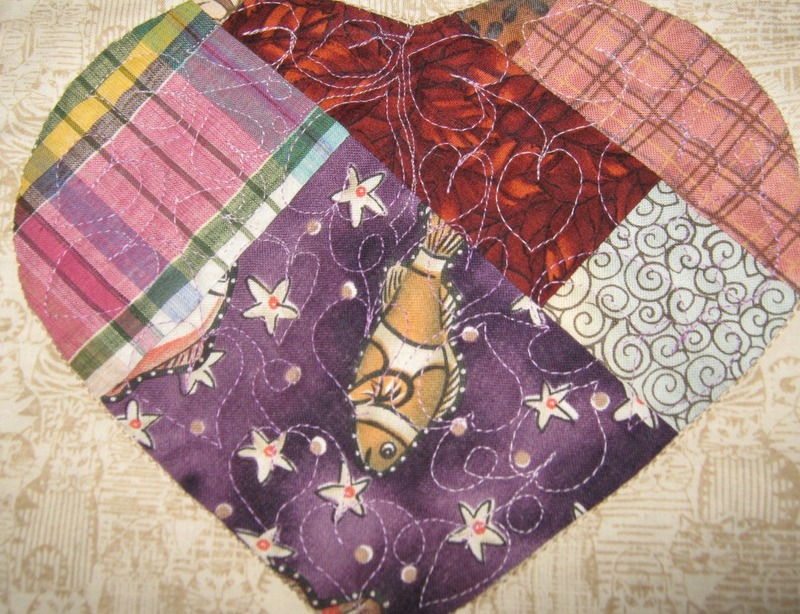 The February FMQ Expert is Diane Gaudynski. 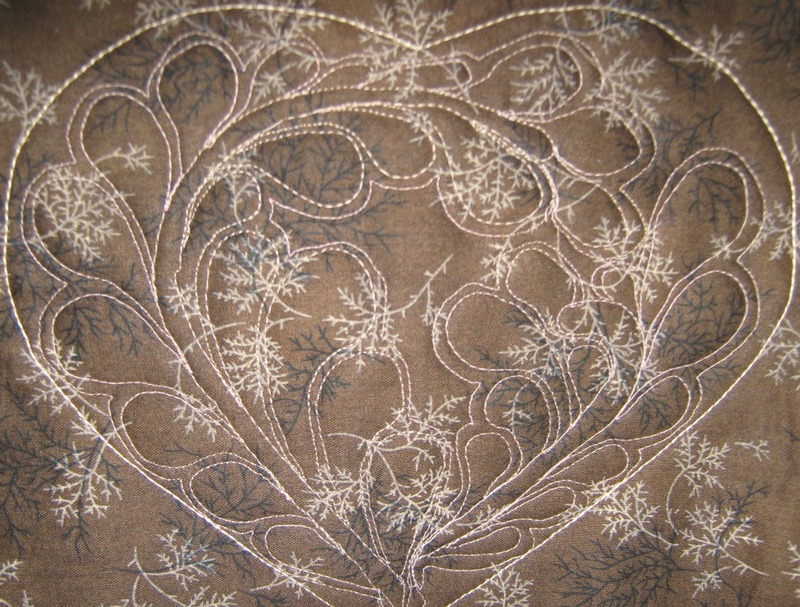 Diane creates beautiful feathers with free motion quilting. When I first viewed her tutorial I thought I would wait until I had more experience before I attempted her technique but I am thinking of this challenge as a learning experience. A STEEP learning experience!! I was glad to read she uses Aurifil 50wt thread as well, so I knew my tools for the job weren’t going to hold me back. My feathers are a little shaky in places but with practice I will be able to look back at this block and see improvement. Well, that’s the plan…. I will be brave and show you the back of my quilting. 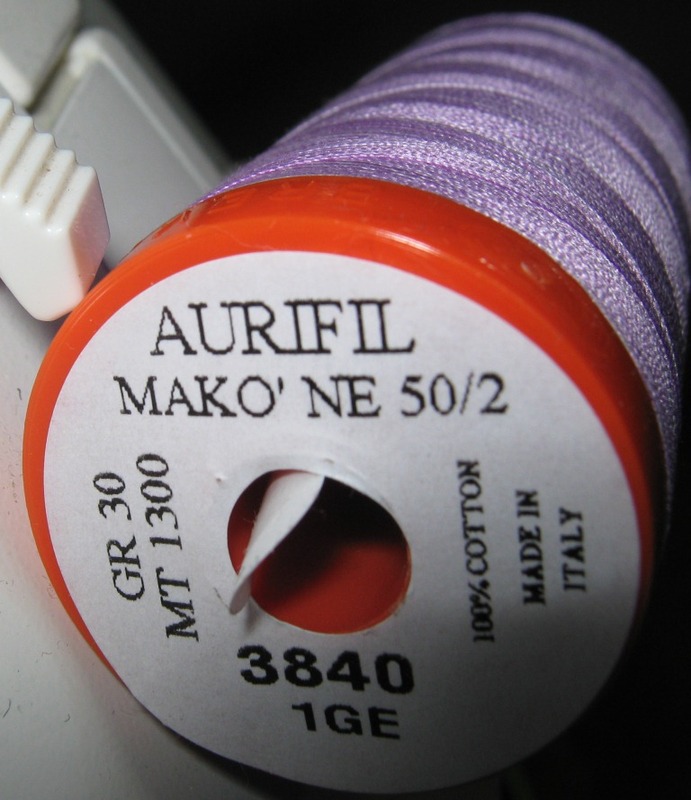 I have used Aurifil 28wt thread with a walking foot for quilting in the ditch around my heart . I am looking forward to the March tutorial with Ann Fahl. Yes…..I will share the results with you each month. Sharing my imperfect attempts at FMQ is quite humbling but we all have to start somewhere and I can only get better. I must remember to breathe whilst moving my hands and pressing my foot down!